I’m sure you’re all well aware that I’m in the midst of reading this year’s Independent Foreign Fiction Prize longlist, but the world of publishing (at times) can be hectic, so it’s no surprise that I already have half an eye on next year’s possibles. Today’s choice is a book which may well be in consideration next time around, a story of two journeys, one literal and one metaphorical, which eventually meet with unexpected consequences. Now doesn’t that sound just like something the IFFP panel might love? 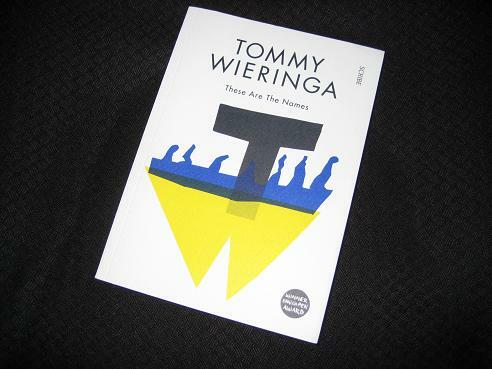 Tommy Wieringa’s These are the Names (translated by Sam Garrett, review copy courtesy of Scribe Publications) is a novel set on the edge of the vast steppes somewhere in the former Soviet Union. In the run-down town of Michailopol, a long way from the usual centres of civilisation, police officer Pontus Beg goes about his daily life, trying his best to do his duty as well and as honestly as can be expected in a locale built upon petty corruption. At fifty-three, Beg is content with the monthly nocturnal visits from his housekeeper and any additions to his salary he can squeeze from people who foolishly transgress on his watch. However, the memory of a song from his childhood and an encounter with a local religious leader set his life on a slightly different course. These two strands are the basis of Wieringa’s novel, and they’re both interesting stories in their own right. The reader is treated to sketches of two facets of post-Soviet life, the run-down provincial nest and the plight of refugees, desperate to make it across the border to start a new, better, life. In These are the Names, though, we are constantly aware of the parallel actions, always waiting for the point at which the two stories will inevitably intersect. However, he’s not just a man of thought. His job, naturally, exposes him to the darker side of society, and he can also be violent, laying down the law of the jungle in a place where more civilised measures are doomed to failure. Beg is a man trying to understand his own nature and history, taking a growing interest in Jewish culture after his talk with the rabbi, the last Jew in town. The more he learns about the faith, and the rituals, the more it all starts to make sense; having always had a sense that something was missing from his life, he is eager to make up for lost time. But with the rabbi being the last of his people in the town, is it all just a little too late? The chances of success are minute, but for the travellers trying and failing is still better than what they left behind (living in a wealthy nation that ships its refugees off to prison camps offshore, I have to wonder how true that is…). These are the Names is an enjoyable read with short, alternating chapters (from the view of Beg and the travellers) and a palpable air of tension as we wait for the ‘wave’ to break upon the town. With a deceptively casual style, you find yourself surging through the book at a fair rate of knots – it’s definitely to Garrett’s credit that it’s always a smooth read. Which, of course, is not to say that this is all it is. As you can see from the paragraphs above, this is a book which pushes the reader to look into corners they’d rather pretend didn’t exist.